In this post I’m going to demonstrate how you can easily take a simple C# console application and convert it into a regular Windows application. It will involve just a few code changes and one project settings change. There are actually two methods to do it – a method in which you end up with almost the same code the wizard normally generates, and a method in which your application class becomes the main form. I’m only going to demonstrate the first method in this post; I’ll cover the second method in my next post. 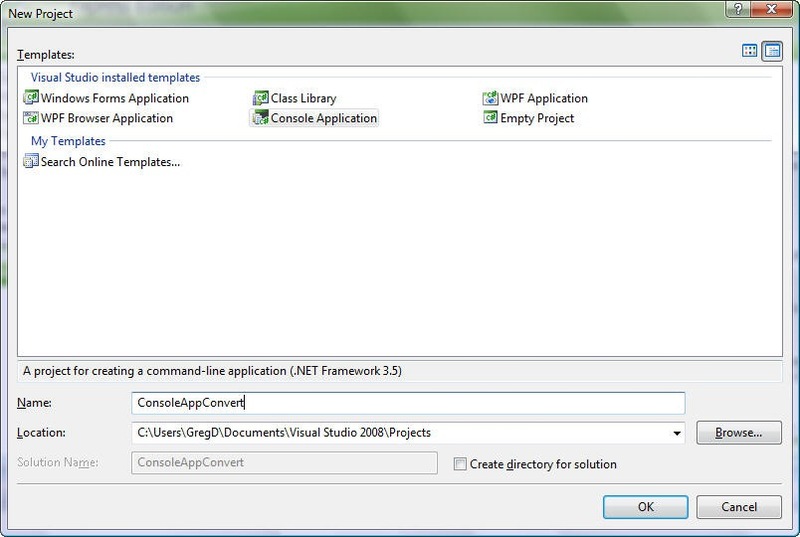 The instructions presented in this post are for Visual Studio 2008, but most should work in a similar way with previous versions. I’m also going to use Express for the programmers who don’t have full blown Visual Studio. For demonstration purposes I’m creating a C# console application from the wizard. Of course, if you already have a console app you want to convert, open your project instead. Remove the “args” parameter from Main(). You can optionally add “Application.SetCompatibleTextRenderingDefault(false);” right under the EnableVisualStyles() call, but it’s not required. I mention it because this is what the wizard adds when auto-generating a project, but its purpose is beyond me (if you know what this function does, please leave a comment). Step Six: Compile and Run! In my next post I’m going to show you an even simpler way of doing this very same thing. Instead of explicitly adding a Form resource to the project, we’ll just take the class which houses Main() and turn it into a form programmatically. You’ll even be able to use the Form Designer to add controls and modify layouts. *Get new posts automatically! Grab the RSS feed here. Want email updates instead? Click here. This entry was posted on February 8, 2008 at 5:59 am	and is filed under C# Programming, General Programming, Tips and Tricks. You can follow any responses to this entry through the RSS 2.0 feed. You can leave a response, or trackback from your own site. When you have a windows application the System.Console.Write() does not output to the command window in DOS. It seems difficult without compiling the application twice to have a program that works both with a windows UI and with the console. I was with you fine up to step 6, but when I add a button to the form, and try to code the event, it opens a Form1.cs, the initialise component function should be in the main program.cs file right? I can’t access the main() function from the form1.cs class. No, the InitializeComponent() function should be in Form1.Designer.cs. It’s automatically generated by the designer. In a couple of my other tutorials I have the InitializeComponent() function in the main.cs file (where I show how to create a form without the wizard), but that does _not_ apply to the code in this article. And the event handler should also be in Form1.cs. For your second method – you should definitely _not_ call main()! This is the entry point of the application and is only called by the debugger or the operating system to launch the program. That’s why you got the thread error – your program was trying to call its own entry-point, which then caused Application.Run() to create a new message loop inside the same program instance of the first message loop. If you really want to launch a new instance of your app when the button is clicked, there are special ways to do this, but I don’t think that was your intention. The main() function isn’t the event-handler of the button – the event handler is placed in Form1.cs and is called something like button1_Click() (depending on how you named the button). You should put all the event handling code for the button inside that function. could you help me to do this???? 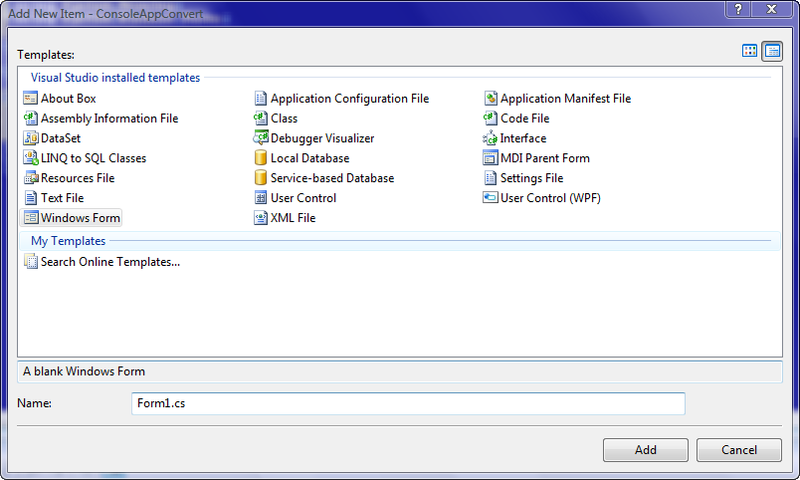 Nojy – You can still have the Console.WriteLine() calls in a WinForms project, but they just don’t do anything. The Console.ReadLine() calls need to be removed because there’s no console for the user to respond. Consider changing these to MessageBox.Show() or pop up some custom dialog for user input. But I could use it instead of Console.Write() but it is not all thing that I wanted. nojy – You can use MessageBox.Show() and get the result of button clicks (like “Yes,” “No,” “Cancel,” etc.). If you need to get text that the user typed, but need to create a separate dialog with a textbox control on it. When the user clicks OK (or otherwise closes the dialog), write the contents of the textbox to some public property of the dialog class. Then in the calling function, read this property and you’ll know what the user typed. thank you for your guidance Greg. 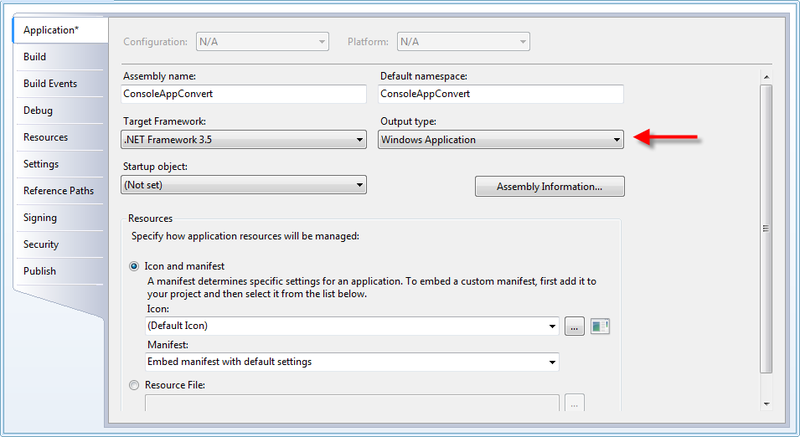 how about convert VS 2008 from window application into web application? I’ve a console program which takes command line arguments, I’m searching ways to give it GUI in Visual c#. Any help guys?? Then you can access the command line arguments through the “args” array. please help me i create some project with c# programing lenguage. i used windows console. my program is working well but i want save result one txt file. i dont know how can i do. can you help me ? my project code here if you now if you can please create my project and sent my mail adresses. my mail adresses canes_demirel@hotmail.com i will wait. int sayi = new int; //6 lık bir dizi oluşturulur. int cekilen = 0; //rastgele çekilen sayıyı temsil eder. int gec = 0; //sayıların küçükten büyüğe sıralanmasında kullanılır. if (kolon 10000) //eğer 8 den büyük bir sayı girilirse. Console.WriteLine(“\nEn az 1 en fazla 8 kolon oynayabilirsiniz! \n”); //uyarı! while (kolon 10000); //kolon seçme işlemi kural sağlanana kadar sürer. cekilen = rastgele.Next() % 49 + 1; //sayı çekildi. sayi[i] = cekilen; //diziye aktarıldı. if (sayi[i] == sayi[k]) //eğer o sayı daha önce çekildiyse(aynı kolonda) yeni bir sayı çekilir. thank you very much it is working!